The Zip disk is manufactured by Iomega and it is often called an Iomega Zip disk. It is a 3.5-inch removable floppy diskette but differs in some significant ways from standard floppies and therefore this format is discussed separately on this website. 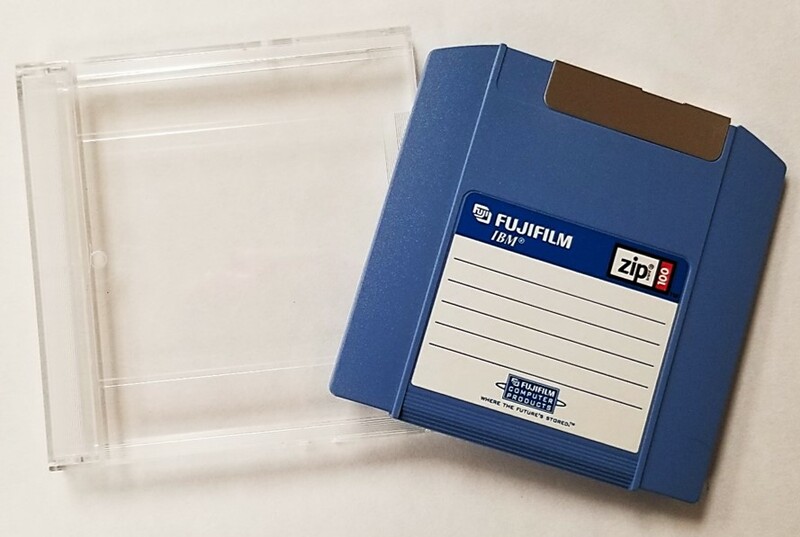 Like other floppy disks, the structure consists of a base of polyester plastic that is slightly thicker than what is found on a standard floppy, but of course it is still flexible. The polyester base is coated on both sides with a polymeric binder that contains the magnetic oxide particles. The magnetic particles are where the digital information is stored. This binder-oxide coating is of better quality and with a smaller oxide particle size than standard floppies. These smaller particles allow for a greater storage capacity than a standard 3.5-inch floppy disk because the read/write heads in the equipment can be smaller and thus more tracks can be packed on the disk of the same size. The disk is housed in a rigid plastic jacket with a metal sliding gate just like a standard 3.5-inch floppy diskette. The jacket is thicker and of better quality than for the 3.5-inch format and contains a woven liner to keep the disk surface clean. The following image shows a Zip diskette where the plastic jacket has been opened. The white liner is clearer evident as is the actual diskette, which is indeed a floppy or flexible disk. The Iomega disks come in capacities of 100 MB (introduced in 1995), 250 MB (introduced in 1998), and 750 MB (introduced in 2002), which are significantly higher than the regular 3.5-inch floppy disk, which is generally 1.44 MB. In fact, the 750 MB provides slightly more storage capacity than a CD (700 MB). This diskette cannot be read in a standard 3.5-inch drive but instead requires its own Iomega Zip drive. A common reported problem is users, which are unfamiliar with the format, placing a regular 3.5-inch floppy disk in an Iomega Zip drive and damaging the drive. The drives can be internal drives, like the floppy drives that typically came with computers or they may be external drives. Note that not all Iomega Zip drives read all Iomega Zip disks. The 100 MB drive can only read and write 100 MB disks. The 250 MB drive can read and write both 250 and 100 MB disks, whereas the 750 MB Iomega Zip drive can read all three-capacity disks, but only write the 750 and 250 MB disks. The read and write speeds of these Iomega disks are faster than the standard floppies, but still nowhere near the speeds of hard disk drives. A similarity with hard drives is that the read/write heads float over the surface of the disk and do not make contact with the disk surface, as is the case with standard floppy disks. 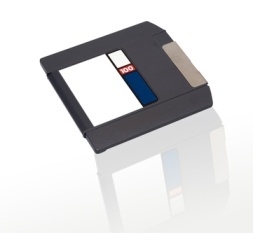 It is believed that Zip disks are more reliable than standard floppy disks although a major recall has occurred in the past due to failures commonly referred to as the “Click of Death.” They still can be damaged from dust, dirt, and debris, and therefore use and storage areas should be kept clean. 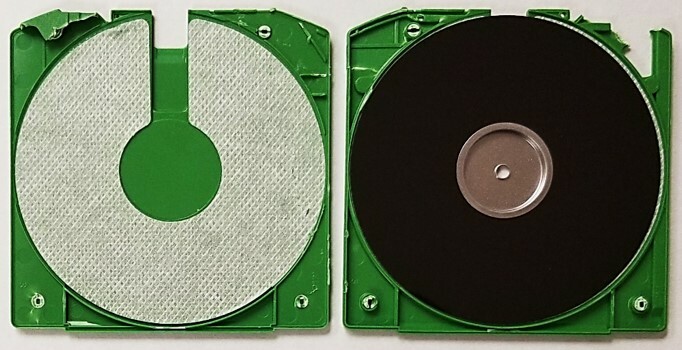 These disks often come with their own plastic storage case as shown in the image. When the disk is not being used, it should be taken out of the drive and stored in the plastic storage case to minimize contamination and damage. See the floppy disk storage page for more information. With such high capacities, these disks are an option for the storage of large digital files such as high quality digital images, audio, and short video clips, and therefore can potentially be used for digital scrapbooking storage media, if one chooses to do so. However, for the most part, other options are more economical and better suited for the long-term storage of digital files. The exact lifetime of this format is not known but it can be assumed similar to other floppy diskette formats. A lifetime range of 5 to 15 years is a reasonable guess when stored under standard office conditions. However, because of the better construction and the reading/writing technology used, it is likely that the longevity of these disks resides at the upper end of this range. Although the drives and disks are still available, this format never gained much popularity in the marketplace. This is due to the availability of other formats such as optical discs, which provided greater capacity and more liked by consumers. Once the recordable DVD format was introduced, this severely affected the market for the Zip disks and sales fell sharply in the early 2000s. Any information stored on this format should be transferred to a more viable and popular format to ensure the data remains accessible into the future.